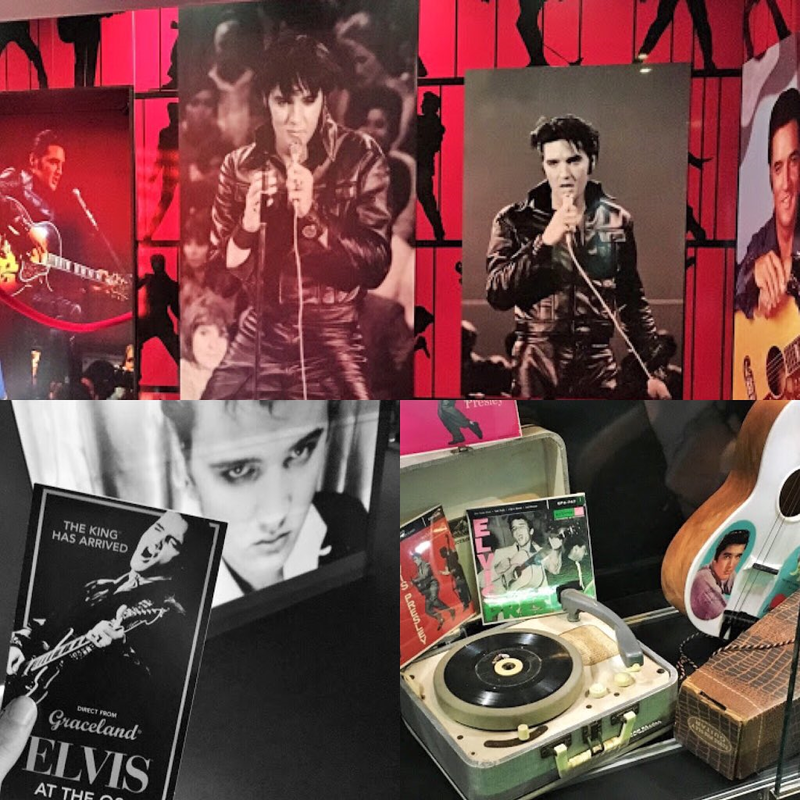 Last Friday I hot footed it to the O2 London, to get my best fangirling on and gawp at the largest Elvis exhibition in Europe. With '360 artefacts specially selected from the Presley family's treasured Graceland Achives' Christmas came early for me. The exhibition chronicles the rise of Elvis and how he influenced popular culture. A love for Elvis Presley runs in my family. My sister once took a book on Elvis out of the library and secretly tore out the photo's of him to stick in her personal 'Elvis file,' before casually returning it (on time to avoid any late return fine). This appreciation for the King of Rock n Roll has filtered down to me, although I've never resorted to vandalism/theft in his name. Yet. Yes, as a family we're all fans. Except for my Dad, who, according to my Mum, was always a bit jealous. Who can blame him? Friday at the O2 was a big day. As a test to see how serious my boyfriend really is about me, I brought him along too. After a moderately heated debate with the love of my life, I point blankly refused to see if our complimentary 'standard' rail tickets were valid for first class travel by plonking ourselves in first class and seeing if we got manhandled back to standard. One standard rail journey later, we got in tourist mode and decided to get a river taxi which dropped us off a stones throw from the O2. I got snap happy (and a bit damp) on the back deck as we sailed by London's landmarks. The exhibition was lovingly put together. At times, gazing at his iconic white jumpsuits in the dimly lit exhibition room, you could almost feel him there. Isn't it funny to think he was unsure how his 1968 comeback special would be received by the world. What would he think if he knew, in 2015, generations of fans still love Elvis Presley? That somewhere, on the shelf of a library, sits a suspiciously thin book devoted with love to The King of Rock & Roll. I should add that on our return train journey home, we did manage to sit in first class. My boyfriend gave me a look that said "See, I told you" and I gave him a look that said "Shut up and pass me a free wine." Are you a die hard fan of anyone? Come on, whose school reports, house keys, champagne from their wedding night, old outfits would you travel to see...in a non-stalkery sort of way? I'm a big Elvis fan too and because of this post, I've just booked tickets to see the exhibition TOMORROW! Of course I'd heard it was on and seen the posters around town but these pictures have just tipped me over the edge. Ah that's brilliant Nicola! I'm excited for you! Let me know what you think of it! The gift shop at the end is amazing! I know what you mean about it being surreal. I felt like that just looking at his clothes.